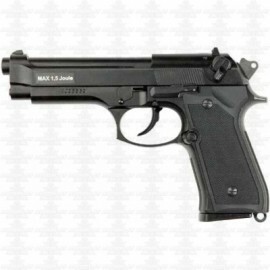 Classic M9 model in a plast version. This M9 offers excellent value for money. The blowback is powerful and fast. The pistol has double action function and a working safety. The Hop-up is adjustable and the double stacked magazine holds 25 BBâ€™s â€“ note that a Co2 magazine is available for this model. Other important information: slide and gunstock are made of ABS plastic, the magazine is metallic. Package contains: replica, a bag of about 100 BB's, fast charging device and instructions manual. We recommend using BB's of 0.20 g and gas ULTRAIR Power (Code: 14571) or PREDATOR (code A1)!